A Bangladeshi tanker lists in the Sela River in the Sundarbans, spreading oil that threatens the environment, Dec. 9, 2014. Authorities in Bangladesh say an oil spill is threatening one of the world's largest mangrove forests and threatening wildlife in a UNESCO World Heritage site. A tanker carrying 350,000 liters or 92,000 gallons of furnace oil sank in the Sela River in the Sundarbans Tuesday after colliding with another vessel, authorities said. It is not clear how much of the oil has spilled into the water, but an oil slick coats the river for 80 kilometers or 50 miles, according to local news reports. The Dhaka Tribune said Friday "very little" has been done so far "in tackling the environmental disaster" because local officials have not decided on an oil removal plan, including whether to use dispersants. 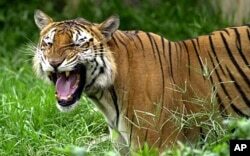 The oil spill threatens the Bengal tiger's mangrove forest habitat in Bangladesh. The newspaper said authorities have asked local people to manually collect furnace oil from the water's surface as it spreads through a wide network of rivers and channels in and around the forest. A spokesman for Padma Oil Co., which owns the sunken barge, said the firm would buy any oil collected by villagers. "It has no commercial value as it can't be used, but we are using the offer to encourage people so that the cleaning up process speeds up," said Rafiqul Islam Babul, according to the AFP news service. "Villagers, including children, are going out onto the river in boats to collect the oil floating on the water using sponges, shovels and spoons," he added. The Sundarbans mangrove forest is known for its wide range of fauna, including 260 bird species, the Bengal tiger and other threatened species such as the estuarine crocodile and the Indian python. It is also home to the rare Irrawaddy dolphin.